Deep in the back of our minds is the understanding that sometimes comfort is at a higher premium than looks. Like Ugg boots and tracksuit pants, comes Celine’s Fortune Cookie Clutch in brushed mohair army green. Half handbag, half pillow, the cuddly clutch looks like a feather filled delight for shoppers who might literally shop ‘til they drop. The cuddly clutch, would be of extreme benefit in this circumstance, as a soft landing for their head would ensure a restful nap, and remember, a powernap could save your fashion life. Undoubtedly there must be many instances where drowsy shoppers have committed sins of the highest degree because they needed a new blouse desperately, but couldn’t continue any longer. In their tired state they have mistakenly grabbed a fashion faux pas. 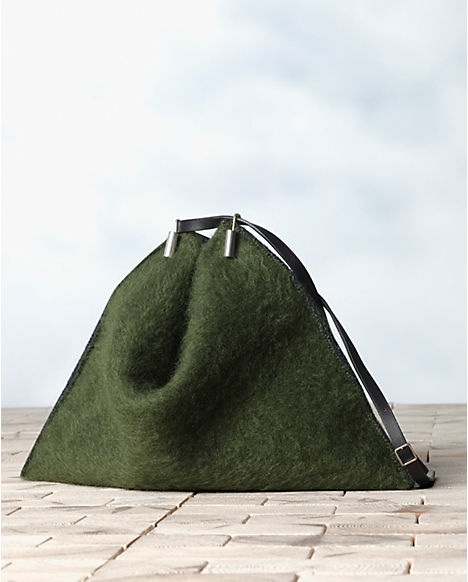 Designed by Celine, the dark green cuddly clutch is a great fashion choice because of its flexibility. It can be carried around when running errands as it will fit seamlessly in with your ‘around the house’ gear. But it also has a good personality that enables it to make statements when dressed up with other, more refined designs.